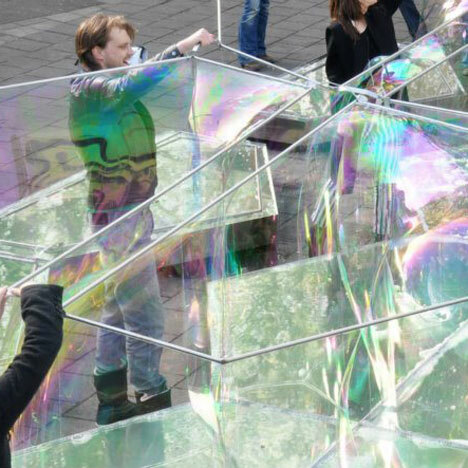 Dutch firm DUS Architects have created a pavilion made of bubbles. Visitors to a Rotterdam square had to construct the soapy walls themselves by lifting metal frames from five-sided steel pools. Anyone standing in one of these pools became enclosed inside one of sixteen massive bubbles. The pavilion was open to the public for less than three weeks and was completed as part of the International Architecture Biennial Rotterdam, which continues until August. We recently rounded up all our projects featuring bubbles, including a lamp that blows its own temporary shades. See them all here. At the very centre of breezy Rotterdam, lies the world’s most fragile and temporary pavilion: The Bubble Building. The temporary pavilion does justice to its name, as it is entirely made of soap bubbles. On invitation by the IABR (International Architecture Biennial Rotterdam) and the ZigZagCity Festival, DUS architects designed a pavilion that instigates interaction, as the pavilion only appears when visitors build it themselves. The Bubble Building opened to the public on April 20th and can still be visited until Sunday May 6th, at the Karel Doormanhof in Rotterdam, NL. The Bubble Building is made from 16 hexagonal shaped mirroring ponds; a shape derived from the natural shape of connected foam bubbles. Positioned in a square plan, the steel ponds create a 35 m2 reflective soap surface, strong enough to carry human weight. This creates a surreal scene, as visitors wearing rubber boots seem to stand on a reflective water surface. No sign of a pavilion, just a few handlebars that hint at what needs to be done.. What happens next, is an instant spectacle: When visitors pull up the handlebars, massive soap walls emerge in a split second. The soap walls appear as super slim glass, wavy, curvaceous, and always different; A multitude of soap walls and a rainbow of colours. Old and young join in to make the pavilion appear, over and over again. While the building is temporary, it refers to monumental architectural themes such as the re-building of Rotterdam. In order to make the building appear, you must erect it yourself, until it pops again. This way, the Bubble Building also is a reference to the current bursting of the economic bubble. Moreover, the Bubble Building is about collective building, as it takes at least two people to erect one cell of the pavilion. The more people join in, the larger the pavilion becomes. Visitors are invited to eternalize their own momentary version of the pavilion in a bubble snapshot, and upload these images to the ZigZagCity website. Online, a multitude of different bubble buildings appear. In these pictures lies the true beauty of the pavilion: the remembrance. As ultimately, the Bubble Building is about beauty. It is said that temporary experiences are perceived as more beautiful, because they only last for a short time. Rotterdam philosopher Erasmus said ‘Homo Bulla Est’ – ‘man is a soap Bubble’. Life is momentary. So go build the Bubble Building, because it will only be there for an instant!